How do I change my Name, Email and Password? If you are a Typepad.com blog user, your name, email and password is still stored in your Typepad account in the Control Panel > Profile tab. If you are using Typepad Connect on another platform, you can update this information via the Account tab in your Typepad Connect account. Where can I change my 'Elsewhere' accounts? You can add, edit or remove Elsewhere accounts via the Profile link. This feature will allow you to add links to your profile on third party services like Twitter, Facebook, Flickr, etc. to your profile. I'm not receiving email notifications. Why? Verify your account settings to make sure that you're properly set to receive email notifications. To do this, select the tab for "Account" that's found in the navigation after you've logged in. Select "Notifications" in the left-hand column. On the page you'll notice several options under the heading "Email Notifications." Check to make sure that your settings are set for you to receive email notifications. How come my comment settings are in TPC and my account settings are in Typepad? This is the case for users on the first-generation Typepad application platform. Once your account has been migrated to the new platform. you'll be able to edit your account settings inside Typepad Connect. How do I set the default comment sorting for my blog? From the Settings tab, scroll to the section called "Display on your blog." Under Layout Options select Threaded or Flat, sorted as your comment display option. Can I use HTML in the comments? You can choose to allow limited HTML in comments from the Settings tab, under the Formatting section. How can I customize the look and feel of Typepad Connect (using CSS)? You can override the default styling of Typepad Connect by adding CSS classes to your own style sheet. We've started some of the CSS documentation here. What are threaded versus flat comments? Threaded comments allow readers to reply directly to each others' comments, fostering a more dynamic conversation on your weblog. 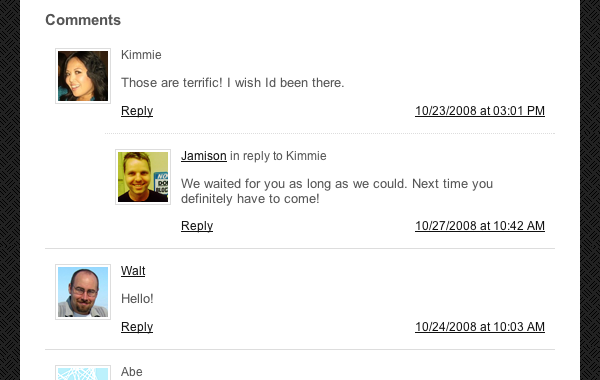 Flat comments are the traditional, chronological comment display. See below: threaded vs. flat. 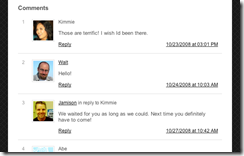 Is there a "reply by email" functionality? Absolutely! 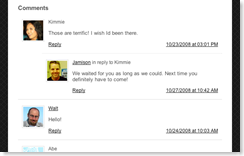 You can reply directly to any comment email to post a response directly to the blog or website. What is the custom commenter profile feature? This feature will allow Typepad Connect users to expand the branding on their sites to the profiles of their commenters. Any reader who views a commenter's profile from your post's comment stream will see the profile styled in your blog's look and feel. Why are comments not displaying on this post? If you are not seeing comments displaying on an individual post, there is likely a code error in the last comment submitted to the post. From the Posts list, click on the name of the post. Then, click the Comments link in the right column to view only the comments submitted to that post. Click to Edit the most recent comments and look for any open HTML tags which need to be closed or removed. Why can't some readers comment? Some older browsers do not support the script used for Typepad Connect. Readers of your site will want to make sure they are using the latest version of their preferred browser to comment. Also, we would recommend clearing your browser's cookies and cache as a corrupt cookie may be causing an issue. Information on clearing your browser's cookies and cache can be found here.